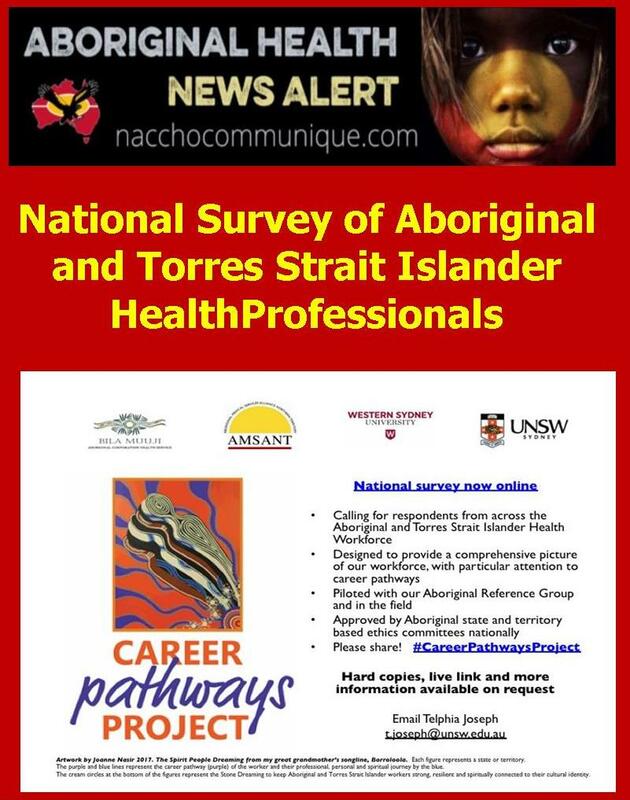 NACCHO Aboriginal Health Workforce Survey : Please support #CareerPathways the first national survey of Aboriginal and Torres Strait Islander health staff across all professions, roles and locations. Welcome to the first national survey of Aboriginal and Torres Strait Islander health staff across all professions, roles and locations. It is designed to better understand the development needs and career pathways within the Aboriginal and Torres Strait Islander health workforce to inform strategies to improve employment, retention and career opportunities. All Aboriginal and Torres Strait Islander staff, present and past, are invited to take part. Who is running this survey? This survey is part of the Career Pathways Project, funded by the Lowitja Institute. The Project was initiated by Aboriginal Community Controlled Organisations (ACCHOs) and is led by Aboriginal and Torres Strait Islander investigators, partners and field researchers. Partners and collaborators include Bila Muuji, AMSANT, UNSW Sydney, Western Sydney University, ACCHOs and government health services, as well as professional associations (including CATSINaM, IAHA, AIDA and NATSIHWA) and NACCHO affiliates. Your privacy Please be assured that your privacy is our highest priority and your anonymous response cannot be linked back to you. In the survey you will be asked about any qualifications you may have, your past and current employment in the health sector, the barriers you may have faced in your work-life, opportunities you have had, and your ideas to improve career pathways for Aboriginal and Torres Strait Islander health services staff in the future. If you have done the survey before – thank you! Please do not complete it again. What is the research study about? You are invited to take part in the “Career Pathways Project”. This research study seeks to learn from Aboriginal and Torres Strait Islander people who are employed in the health sector about their career development and progression and their ideas for improving career pathways. We will also seek to hear the views of other key people in the health system. Who is conducting this research? The project has many research partners: Bila Muuji Aboriginal Health Services Inc., Aboriginal Medical Services Alliance Northern Territory, Western Sydney University, UNSW Sydney, Awabakal Medical Service, Western NSW Primary Health Network, Western NSW Local Health District and South Western Sydney Local Health District. The research is being funded by the Lowitja Institute. Do I have to take part in this research study? Participation in the project is voluntary. If you do not want to take part, you do not have to. Your decision whether or not to participate will not affect your future relationship with your employing organisation or with any of the other research partners. What does participation involve and are there any risks involved? If you decide to participate you will complete this online survey which should take about 10-15 minutes of your time. The survey will cover your work history in the health sector, your experiences working in health, your views about the opportunities for career development in health, and what may help or not in progressing the careers and opportunities for Aboriginal and Torres Strait Islander health staff. We don’t expect the questions to cause any discomfort, however if you would like to talk to someone you can let the research team know – see details at the end of this page. What are the possible benefits to participation? We hope that you enjoy sharing your experiences and ideas about how Aboriginal and Torres Strait Islander health staff can be supported and developed in their careers. All of the information put together will provide information and guidance for health service managers and other stakeholders who want to grow and develop the Aboriginal and Torres Strait Islander health workforce. How and when will I find out what the results of the research study are? A plain-language summary report of the survey findings which will be placed on the Lowitja Institute website and circulated to peaks and affiliates, professional associations and other key stakeholders to distribute to their members. We will also write articles and present the results at conferences. All the information published and presented will be done in a way that will not identify you – the survey is anonymous. What if I want to withdraw from the research study? If you do consent to participate, you are free to stop participating at any time by ending the survey and exiting the site – your data will not be used if you do not complete and submit the survey. If you complete and submit the survey we cannot remove your responses as we will not know which responses our yours – the survey is anonymous. What should I do if I have further questions about my involvement in the research study? If you want any more information about this project you can contact a member of the research team. Awesome to see this promotion of the survey. Thank you NACCHO!